Those who recall Vice President Richard Nixon opening the VIII Olympic Winter Games here on February 18, 1960, know Lake Tahoe’s Squaw Valley Alpine Meadows resort simply as “Squaw Valley.” And, after 58 years, it just keeps getting better. Here’s why. The aerial tram brings skiers and snowboarders of all levels up to High Camp, where a variety of trails can be accessed. Squaw Valley’s learning terrain is at the top of the mountain. 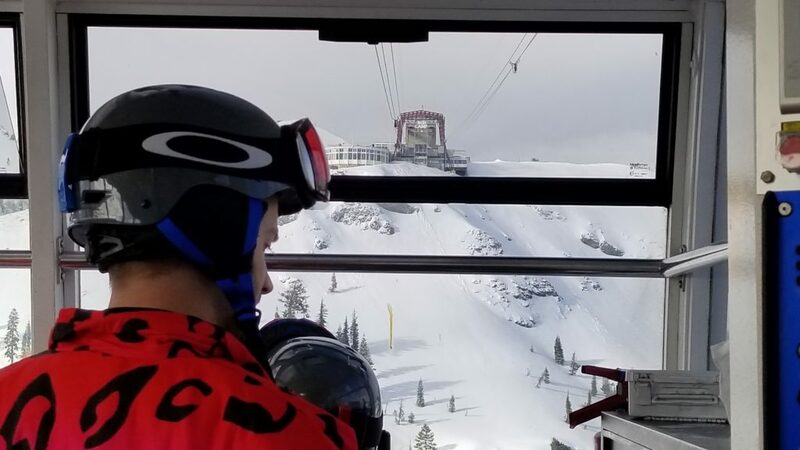 Novices are spared the terror that comes from having to ride a chairlift because an 8-minute aerial tram take you from the base to 8,200 feet, where broad green trails are well groomed, sunny and scenic; a perfect introduction to the magic of snow sports and the mountains. High Camp, at the top of the Gold Coast lift, is one of my favorite places on earth. Site of the resort’s pool and hot tub (open spring through closing, which can be as late as July 4), it has peak-fringed vistas of Lake Tahoe, and the startling granite spires of Silverado and Broken Arrow. Cutting through the thin air is the glistening Sierra Nevada range and warming the belly, the imaginative alpine fare at scenic Granite Bistro. Be sure to show love to the Olympic Museum, a photo display of the 1960 Winter Olympics that put Squaw Valley on the world map. There’s no nursery or daycare here; skiers age 3+ and snowboarders 5+ are encouraged to develop a lifelong love of winter sports. The kids center accommodates up to 400 on a busy weekend, as well as many local racing teams. We love that classes for ages 3-7 are limited to four participants and if you buy five, the sixth lesson is free. Story telling ski school instructors. My “Learn to Ski and Snowboard Month” group skied for two days with Tim Reeve and Kirsten Soi, a father and daughter with a passion for the Olympic Valley. They wove in the feats of Johnny Moseley and Julia Mancuso with every lesson on body alignment, and the mountain’s tragic accidents while practicing turns. Their stories elevated our spirits, encouraged our legs, and kept us skiing, as great teachers should. The Village at Squaw Valley has family-friendly shops, restaurants, a wine bar, yoga studio and great coffee. The Village at Squaw Valley is everything a skier could hope for at the beginning or end of the day. No need to move your car – on your way to the lifts there’s Coffeebar for a lavender infused chai latte, and WildFlour for homemade bagels with avocado and scrambled eggs. Lunch options, if you aren’t dining mid mountain, range from sushi to Soupa, a slow food soup and sandwich emporium with gluten free fare, quinoa bowls and a yummy pumpkin sri racha chowder. 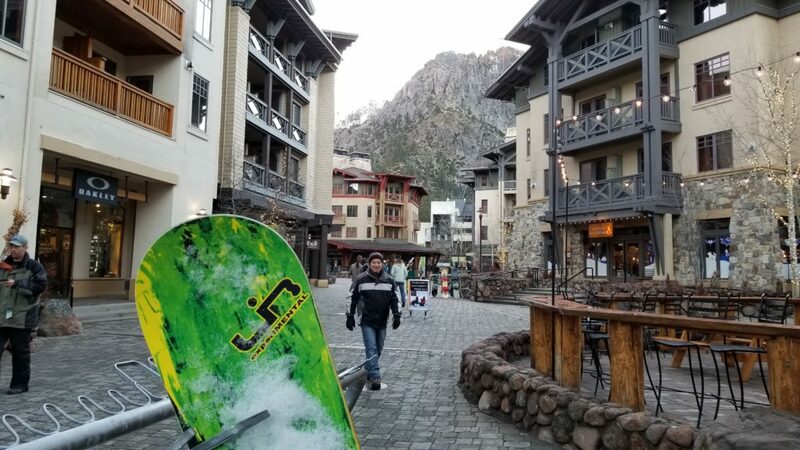 Necessities like ski condo snacks, gear rentals and the latest in snow fashions are tucked into the one story alpine style pedestrian mall. Families who book a suite in one of the Village of Squaw Valley buildings enjoy a full kitchen, fireplace and access to eight hot tubs (tip: mountain view hot tubs are in Building 3). Our favorite part was the heated flooring in the bathroom, which meant you could leave your wet clothes on the floor! Organizers of yoga festivals around the world, Wanderlust has a beautiful yoga studio at Squaw Valley. My Yinyasa class with Cicely was so unexpected; a great way to soothe ski fatigue and a wonderful family bonding event. 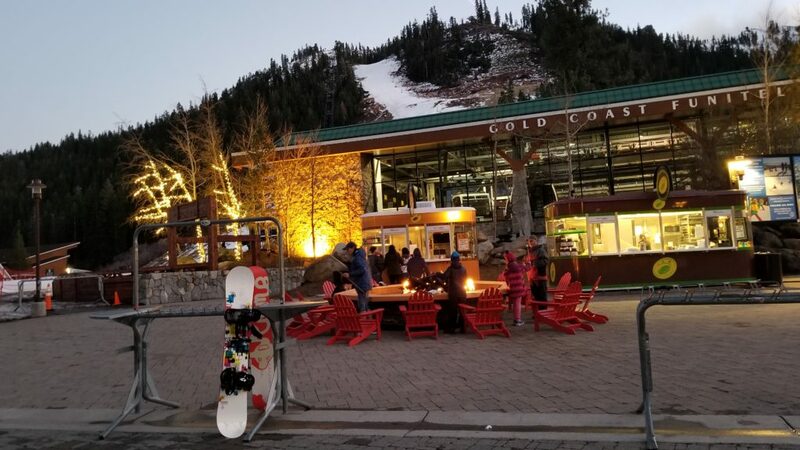 Food trucks and fire pits take over the Village at Squaw Valley for a relaxed and fun apres-ski open to all ages. Work hard, play hard Squaw Valley is known for its après ski, particularly in spring when the warm temperatures and long days attract everyone outdoors. The pinnacle of partying may be High Camp, but le Chamois in the Village is the classic tall tales ski bar. Its upstairs Loft overlooks Olympic House, inspiring guests to swap slope stories over a 50/50 CAPA craft beer. Have enough of the crowds? Tranquil slopes reign at Alpine Meadows, the neighboring mountain resort purchased by Squaw Valley in 2011. With 2,400 skiable acres, 13 lifts, and a vertical drop of 1,802 feet, there’s plenty of terrain to keep all skill levels happy in a mellower package. 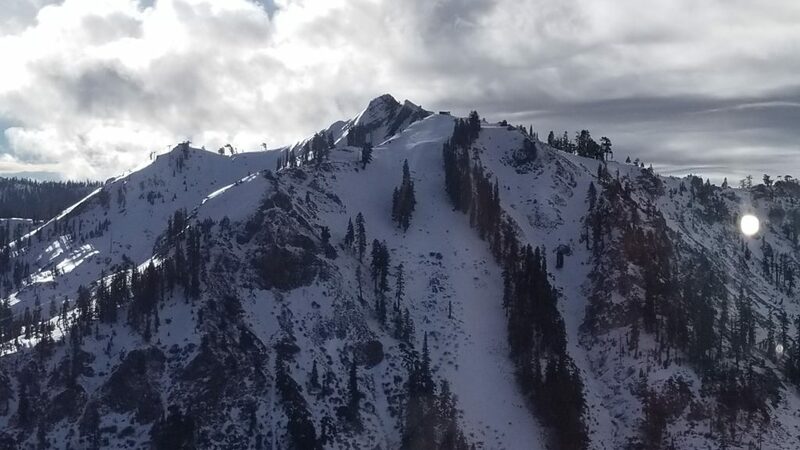 The gnarly chutes off the KT-22 lift that Squaw Valley is famous for, seen from the gondola. Don’t miss Rocker @ Squaw, an expansive superfoods café in the Village where white walls boast free form graffiti depicting the many Olympian athletes who have trained at Squaw Valley. From a Sun Bowl of black garlic quinoa, kimchi, and yams to the signature half-pound burger, it’s easy to store calories for another day on the slopes. Remind the kids that there’s plenty of white space waiting to commemorate the next generation of alpine heroes. 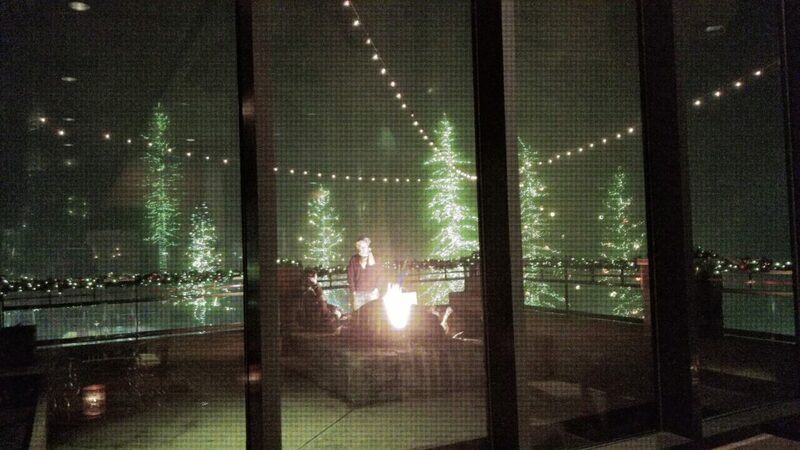 The posh Resort at Squaw Creek lights up its gardens and has nightly fire pits on the deck over the winter holidays. The elegant dining room at Olympic Valley’s only four-star resort, the Resort at Squaw Creek, is as impressive at its sleek black glass home. The focus is on the best quality local ingredients, either grown on property (there are rooftop gardens), or within 50 miles. They excel at grass-fed carnivore feasts, with a few seafood options, unusual vegetables and California fresh salads. Definitely epic. Did you know that Squaw Valley Alpine Meadows is part of Alterra Mountain Company, comprised of 13 great destinations: Steamboat and Winter Park in Colorado; Mammoth Mountain, June Mountain and Big Bear Mountain Resort in California; Stratton in Vermont; Snowshoe in West Virginia; Crystal Mountain in Washington, Tremblant in Quebec, Blue Mountain in Ontario; Deer Valley and Solitude in Utah; plus CMH Heli-Skiing & Summer Adventures in British Columbia. Their new Ikon Pass (available for 2018-2019 season) will provide access to 37 destinations (77,000 skiable acres) in North America, Japan, Australia and Chile. Expect to hear more about it from the U.S. Ski Team’s Mikaela Shiffrin, a brand ambassador who brought home a Gold and a Silver Medal from the 2018 Winter Olympic Games in South Korea.